Draft: 2012, Detroit Tigers, 13th rd. Devon Anthony Travis ... Was a four-year varsity player for Palm Beach Central High School in Florida...Named Big School's Player of the Year as a senior in 2009 ... Attended Florida State University...Named a First-Team All-ACC in 2011...Claimed Second-Team All-America honours in 2012, his junior season ... Participated in the 2019 Blue Jays Winter Tour. Played in a career-high 103 games... Tied a personal best with 11 homers (2016) while setting a new mark with three triples ... Batted .306 (15-for-49) with five doubles, three home runs and 12 RBI across 14 interleague games...Among AL batters in IL play since he came into the league in 2015, ranks 2nd in AVG (.339), 6th in OPS (.985) and 8th in SLG ... Went 2-for-4 with a double on April 6 at TEX to snap an 0-for-12 skid... Was his 1st extra-base hit and 1st multi-hit game of 2018 ... Hit his 1st home run of the year on April 26 vs. BOS...Was his first homer since May 31, 2017 vs. CIN...Also tripled as part of a 2-for-4 effort... The triple was the 2nd of his career (Aug. 8, 2016 vs. TB) and snapped a 0-for-10 drought ... Optioned to Triple-A Buffalo on April 29 and was recalled again on May 22... Hit .210 (13-for-62) for the Bisons (2B, HR, 4RBI)... Had hits in each of his last eight games there ... Recorded his 2nd home run on May 23 vs. LAA...Was his 2nd career opposite-field homer (also June 19, 2016 at BAL) ... On May 28 at BOS, hit a triple before Teoscar Hernandez tripled, forming Toronto's first back-to-back triples since July 27, 2012 at DET (Brett Lawrie/Omar Vizquel) ... Homered in back-to-back games for the 3rd time in his career on June 15 and 16 vs. WAS (last: May 24 and 26, 2017)... The latter blast was the first home run by a RHH off Max Scherzer since Aug. 7, 2017 (Giancarlo Stanton) ... Connected for a three-run blast for his 5th HR of the year on June 24 at LAA...Marked his first road home run since May 24, 2017 at MIL ... Hit his 3rd career grand slam on July 11 at ATL (last: May 26, 2017 vs. TEX)... Was also his 3rd career 4-RBI game... His three slams are two more than any other second baseman in team history ... Went 4-for-4 on July 12 at BOS to tie career high in single-game hits (3rd time) ... Drove in multiple runs in three consecutive games for the 1st time in his career from Aug. 2-4 at SEA ... Connected for his 9th home run on Aug. 13 at KC, his 5th to break a 0-0 score ... Tied a career high with his 11th home run (2016) on Aug. 29 at BAL... Marked his 34th HR as a Toronto 2nd baseman, surpassing Orlando Hudson for 3rd all-time (Aaron Hill-90, Roberto Alomar-54)... Also doubled twice for his 2nd career 3-XBH game (also 1-HR and 2-2B on June 19, 2016 at BAL) ... On Sept. 11 at BOS, stole home for the 2nd time in his career (also May 13, 2017 vs. SEA) as part of a double steal with Jonathan Davis. Drove in a run with a single in the 9th inning on April 14 vs. BAL to end a career-long 0-for-29 hitless drought (previous hit was April 5 at BAL) ... Hit his 1st HR of the year on April 23 at LAA (58th AB)…His longest prior stretch without hitting a HR to start a season was 31 AB in 2016 (homered in his 2nd AB in 2015, his 3rd career PA) ... Stole two bases for the 1st time in his career on April 27 at STL (GM2), one of two Blue Jays with a multi-steal game in 2017 (Pillar - April 19 vs. BOS) ... Stole home as part of a double streal on May 13 vs. SEA, the first Blue Jay to steal home since Russell Martin (part of DS) on June 2, 2015 at WAS ... Put together a 13-game hitting streak from May 14-29, the longest by a Blue Jay in 2017 ... Doubled twice in three consecutive games from May 14-16, giving him 13 doubles in 17 games after hitting just one in his first 19 games...The 3G stretch was tied for the longest multi-double streak in 2017 with Odubel Herrera ... Hit his 2nd career grand slam on May 26 vs. TEX (also May 3, 2015 at CLE), becoming the 1st Toronto second baseman with multiple grand slams...Marked the first grand slam by a Toronto #8 hitter since Brett Lawrie on April 15, 2014 vs. MIN ... Tied a career high with four hits on May 29 vs. CIN (also Aug. 8, 2016 vs. TB) while picking up his 16th double of the month ... Hit his 5th home run of the season on May 31 vs. CIN, the 4th HR in his last nine games ... Led the Majors with 16-2B in May (next closest player had 10-2B)…Those 16-2B were T-4th most in any month by a second baseman in MLB history (Billy Herman, CHC-19 in July, 1935; Brian Roberts, BAL-17 in June 2008 and Frankie Frisch, STL-17 in May 1930)…It was the most 2B hit by any Toronto player in May and 3rd most in any month ... Led the Majors with 20 XBH in May, the 2nd most by a Toronto player in May (Encarnacion-22 in 2014) and the most by any second baseman in club history in any month (previous: Aaron Hill-16 in Sept, 2009) ... Among the AL in May, ranked 4th in AVG (.364) and T-7th in hits (36)…Hit just .130 (10-for-77) with 3-XBH in April ... Became the 1st player to lead the Majors in doubles on June 1 (through games of May 31) after hitting just 2-2B or fewer in April since Harvey Kuenn (DET) in 1956 (2-2B in April and 11-2B in May) ... Played in a career-low 50 games before being placed on the DL on June 6 for the remainder of the season with a bone bruise on his right knee. four-hit game by a TOR 2nd basemen at home since Joe Inglett on Aug. 21, 2008 ...Became the third different TOR player in club history to hit a leadoff home run in back-to-back games after doing so Aug. 5-6...Was the first Blue Jays player to accomplish the feat since since Jose Cruz Jr. (April 22-23, 2000)…The only other Jay to do so was Damaso Garcia in 1983...Opened the game on Aug. 5 at KC with a leadoff home run (3rd career, 1st this year)...Followed it up with a go-ahead 9th inning HR to record his first career multi-home run game…Became the 4th player in modern Major League history to hit a leadoff home run and a game-winning homer with two outs in the final inning of the same game…The others were Snuffy Stirnweiss (1947), Mike Alvis (1967) & Darin Erstad (2000)...Became the first player in six years to hit a lead-off home run and a game-winning home run in the ninth inning or later in the same game regardless of the number of outs…Arizona's Chris Young did it against San Diego on August 7, 2010…Two other players in Blue Jays history did this: Devon White on June 1, 1992, against the Twins and Reed Johnson on June 15, 2003, against the Cubs...Made his season debut on May 25 at NYY, going 1-for-4...It was his first Major League action since July 28, 2015 vs. PHI (left game due to season-ending shoulder injury)...Appeared in nine minor league games (Dunedin-4, Buffalo-5) on his rehab assignment where he hit .306 (11-36) with four doubles and eight RBI...Began the season rehabbing his injured left shoulder after off-season surgery. Was placed on the disabled list twice last season with left shoulder inflammation (May 17 - June 26 & July 31 through the end of the season)... Had exploratory surgery on September 23 where nothing significant was discovered. Was discovered to have a pre-existing acromion bone non-union in his shoulder that is a condition known as an Os Acromiale (non-union of the acromion bone or additional bone in his shoulder)... Underwent surgery at end of October to stabilize additional bone. Earned AL Rookie of the Month honours in April...Led all rookies in hits (26), runs scored (17), home runs (six) and RBIs (19), while posting a .325 average and a 1.018 OPS. His .614 SLG in April was the highest for any 2B since 1914 (Jerry Coleman-NYY was 2nd with a .575 SLG in 1949)... His 1.018 is the highest OPS by any Blue Jays rookie in the month of April. At time of his placement on DL on July 31 ranked 1st in 2B (18), RBI (35), 2nd in hits (66) & XBH (26), 3rd BB (18), 4th in HR (8) & TB (108) among rookies. After returning from DL on June 26 batted .357 (30-84) with 8-2B, 1HR and a .402 OBP… Had nine multi-hit games over the 26 contests prior to his second stint on the DL. Batted .352 (19-54) AVG with RISP. May 3 at CLE hit his 1st career grand slam...Marked the 8th by a Toronto rookie in club history and first since Brett Lawrie on Aug. 10, 2011 vs. OAK. Posted a .386 average with RISP (32-83) with 9-2B, 2HR & 29RBI. Hit his first leadoff HR on April 17 vs. ATL becoming the first Blue Jays rookie to do so since Russ Adams on Sept. 22, 2004. July 26 at SEA collected his 1st career PH, a single, in his first career opportunity. Named the Tigers Minor League Player of the Year in 2013 as he split the season between Single A West Michigan and Single A Lakeland...Led all Single A players with a combined .351 average (177x504), while he was second with 177 hits, fifth with a .418 on-base percentage, and seventh with 261 total bases...Named to the Midwest League's mid-and postseason All-Star squads...Selected the Tigers Minor League Player of the Month for April after batting .341 (30x88) with 19 runs scored, three doubles, a triple, four home runs and 17 RBI during the month...Named the Tigers Minor League Player of the Month for June after hitting .372 (35x94) during the month...Had his contract transferred to Lakeland on June 29...Compiled a season-best 12-game hitting streak July 9-24...Named the Florida State League's Player of the Week for the week ending September 3...Named as the Tigers second-best prospect and as the player with the best strike zone discipline following the season by Baseball America. Made his professional debut with the Connecticut Tigers after being selected by the Tigers in the 12th round of the June 2012 draft. 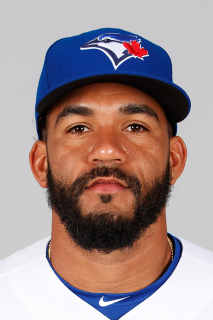 March 25, 2019 Toronto Blue Jays placed 2B Devon Travis on the 60-day injured list. Recovery from left knee surgery. May 22, 2018 Toronto Blue Jays recalled 2B Devon Travis from Buffalo Bisons. April 29, 2018 Toronto Blue Jays optioned 2B Devon Travis to Buffalo Bisons. November 2, 2017 Devon Travis roster status changed by Toronto Blue Jays. October 23, 2016 Toronto Blue Jays activated 2B Devon Travis from the 15-day disabled list. September 2, 2016 Toronto Blue Jays recalled 2B Devon Travis from Bluefield Blue Jays. September 1, 2016 Toronto Blue Jays optioned 2B Devon Travis to Bluefield Blue Jays. May 25, 2016 Devon Travis roster status changed by Toronto Blue Jays. May 19, 2016 Toronto Blue Jays sent 2B Devon Travis on a rehab assignment to Buffalo Bisons. May 13, 2016 Toronto Blue Jays sent 2B Devon Travis on a rehab assignment to Dunedin Blue Jays. November 2, 2015 Toronto Blue Jays activated 2B Devon Travis from the 60-day disabled list. June 26, 2015 Toronto Blue Jays activated 2B Devon Travis from the 15-day disabled list. June 18, 2015 Toronto Blue Jays sent 2B Devon Travis on a rehab assignment to Buffalo Bisons. June 15, 2015 Toronto Blue Jays sent 2B Devon Travis on a rehab assignment to New Hampshire Fisher Cats. May 29, 2015 Toronto Blue Jays sent 2B Devon Travis on a rehab assignment to Buffalo Bisons. April 5, 2015 Toronto Blue Jays selected the contract of 2B Devon Travis from New Hampshire Fisher Cats. November 13, 2014 Devon Travis assigned to New Hampshire Fisher Cats. May 19, 2014 Erie SeaWolves activated 2B Devon Travis from the 7-day disabled list. April 12, 2014 Erie SeaWolves placed 2B Devon Travis on the 7-day disabled list retroactive to April 10, 2014. March 29, 2014 2B Devon Travis assigned to Erie SeaWolves from Lakeland Flying Tigers. January 9, 2014 Detroit Tigers invited non-roster 2B Devon Travis to spring training. June 29, 2013 2B Devon Travis assigned to Lakeland Flying Tigers from West Michigan Whitecaps. March 29, 2013 Devon Travis assigned to West Michigan Whitecaps from Connecticut Tigers. March 2, 2013 2B Devon Travis assigned to Detroit Tigers. September 14, 2012 Devon Travis roster status changed by Connecticut Tigers. August 8, 2012 Connecticut Tigers placed 2B Devon Travis on the 7-day disabled list. July 5, 2012 2B Devon Travis assigned to Connecticut Tigers from Detroit Tigers. July 3, 2012 Detroit Tigers signed 2B Devon Travis.